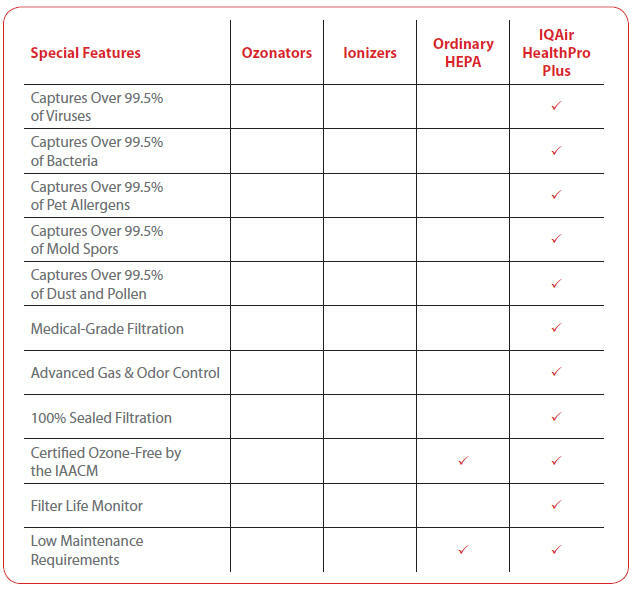 IQAir HEPA air purifiers for superior allergy relief. IQAIR Healthpro Plus New Edition HyperHEPA™ - The Most Powerful Air Filtration Available. Most air purifiers can only filter down to 0.3 microns in size – But 90% of all particles in the air are smaller than 0.3 microns! Virus control: filters H1N1 Flu virus and all other viruses. 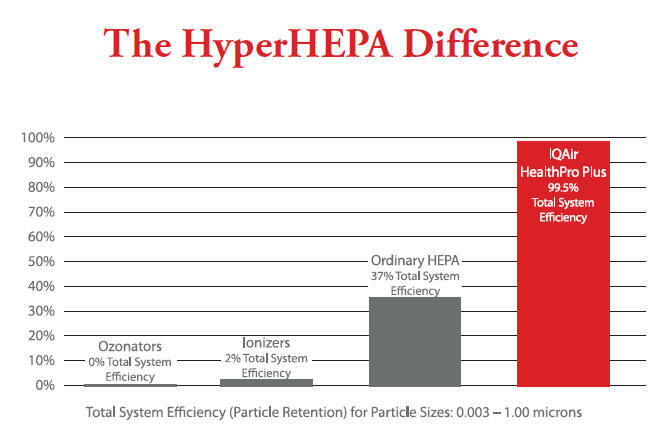 IQAir’s patented HyperHEPA™ filtration filters down to 0.003 microns with a guaranteed minimum efficiency of 99%. This means that HyperHEPA™ can remove up to 100 times more allergens than conventional air cleaners. Most HEPA rated filters cannot effectively filter Cat Dander. The IQAir Healthpro Plus new edition effectively removes all cat dander as well as many other allergens between 1 & 3 microns in size. Call us 7 Days a week at 330-497-6900! Efficiency statements of many air cleaners can look impressive at first glance, but the actual effectiveness of the air cleaner often does not match the claims made for the product. Air cleaners with HEPA filters often advertise efficiencies of 99.97% for particles of 0.3 microns and larger. (That is about 240 times smaller than the width of a human hair.) That sounds very impressive, but this claim is based on the theoretical efficiency of the HEPA filter material used and not on the actual clean air produced by the air cleaner. System leakage and inferior construction can greatly reduce the air filtration efficiency of an air cleaner, and independent testing indicates that many popularly selling air cleaners don’t even meet 10% of their label claims. That’s where IQAir is different. advanced testing equipment can find no particles escaping the advanced HyperHEPA filtration. particle size that is not addressed by the majority of consumer air cleaners are ultra-fine particles. Numerous scientific studies have proven that ultra-fine particles are the most harmful to our health. Ultra-fine particles are defined as “those particles 0.1 microns in size and smaller.” These particles are in a size range that is much easier to inhale and absorb into our lungs than larger particulates. In the case of an ultra-fine airborne irritant such as cat allergens - this faster absorption rate can cause an almost instant allergic response. medical research organizations agree that these ultra-fine particles can significantly increase the risk of heart attacks and strokes. This is because ultra-fine particles are small enough to penetrate a cell’s mitochondria (the center and brain of the cell) and cause cell damage. In fact, a recent study from the California Air Resources Board estimates that ultra-fine particles subtract 10 years from a person’s life. achieved in a home air cleaner. This is because the HealthPro Plus is the world’s first room air cleaner with filters certified under the most stringent filter standard EN (European Norm) 1822. In fact, IQAir’s HyperHEPA filter has received the official H12/H13 certification. 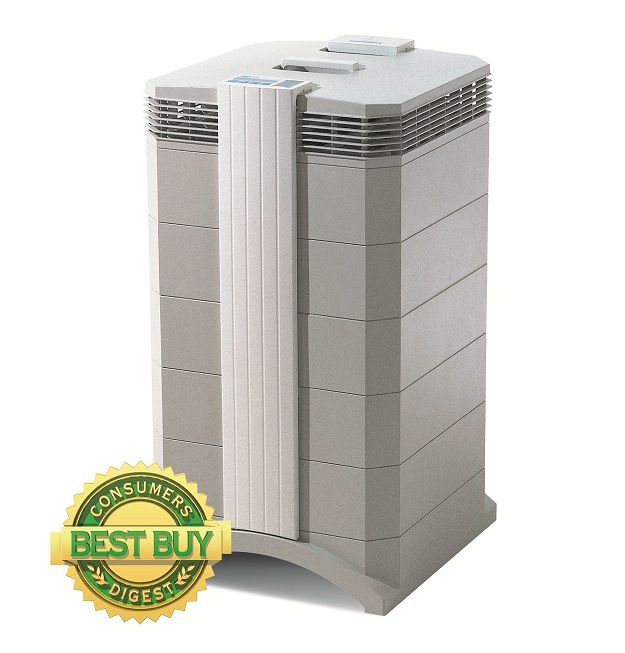 This gives you the cleanest, freshest air that has ever been possible in your home. There are thousands of substances that can create a toxic soup of indoor air pollution and allergens inside your home. The HealthPro Plus removes more of these harmful substances than any other air cleaner. fur that your pet sheds. Pet dander is a known asthma and allergy trigger. to your clothing even if you do not own a pet. Common Flu Virus: Size 0.005-0.3 microns. The flu is an airborne virus. pollen. It affects your nose, eyes, and mouth making it difficult to breath. and cause breathing difficulties in sensitive people. manufacture furniture, carpets, building materials, and many other sources. automobiles and smoke, through a tightly woven, nano-fiber structure. noted that the HealthPro Plus offers its ultra-high efficiency performance while running quietly. testing equipment could find no particles escaping the system’s powerful HyperHEPA filtration. advanced air cleaning solutions: IQAir. Search says that IQAir is clearly #1.
from ionic air cleaners. Even small amounts of ozone are undesirable for allergy and asthma sufferers. Engineered and built at the Hammes family factory in Switzerland, each IQAir air purifier is an example of Swiss precision engineering, superior craftsmanship, and continuous research and development. The Swiss IQAir production facility only uses the finest components, and great attention to detail is given to each IQAir system built (much like a fine Swiss watch). Swiss quality assurance provides you with the very best air cleaner you’ll ever own. The IQAir HealthPro Plus is an investment in clean air for many years to come. IQAir is proud to cover the HealthPro Series in the US and Canada for a full five (5) years against defects in parts and labor. Filters are consumables and exempt from this warranty. 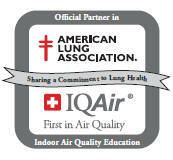 IQAir is proud to have been chosen by the American Lung Association as their educational partner for the air cleaner industry. “We are honored to be selected as an American Lung Association partner” says IQAir President, Frank Hammes. “They are the world’s most reputable organization committed to lung health.” This exclusive partnership combines the American Lung Association’s 100 year commitment to preventing lung disease and promoting lung health with IQAir’s 45 year commitment to air cleaning excellence. IQAir makes the only individually tested and certified air cleaners available for home use. This is a requirement IQAir has for hospitals, and this same level of testing and assurance is provided to all IQAir customers. After all, your home, like a hospital, is a very important health environment. Each HealthPro Plus is individually tested and certified before it leaves the IQAir factory in Switzerland. Your HealthPro Plus arrives to you with a hand-signed certificate of performance so that you will know the exact efficiency of your air cleaner. IQAir is the #1 air purifier used by hospitals worldwide. IQAir was recently selected by the Hong Kong Hospital Authority as the only room air cleaner powerful enough to be used in the fight against SARS. Now you can have the same medical grade air purifier for your home! IQAir is the only air cleaner clinically proven effective for allergic asthma. IQAir passed the most comprehensive double-blind, placebo controlled clinical trial. 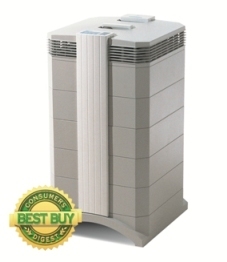 The HealthPro Plus is the top recommended air purifier by medical and healthcare professionals. Protect yourself from household chemicals. Common household products like cleaners and detergents can emit dangerous vapors. Some air purifiers filter particles, but not chemicals or gases. IQAir offers the best gas filtration technology to remove the widest range of airborne chemicals. While ozone is effective at killing germs and MOLD, many purification needs are better suited with a quality filtration system. All IQAir air purifiers are certified to produce absolutely no ozone. Buy from a company that cares about your health! Because HEPA air filters, purifiers are often used in biological and virus control, this HEPA air filter purifier must be returned unopened; sealed in original box. This is for the protection and safety for our customers as this type of purifier is often purchased by medical and industrial facilities, and individuals that cannot risk contamination. Must be sealed, unused, in original box. Actual shipping charges will be deducted from the refund. Please contact us through AllergyPurifiersLLC@o3ozone.com to obtain an RGA number and to get return instructions and address. any IQAir model currently available on the market.